I’ve just been watching the 1947 Hollywood film Carnegie Hall which, in spite of a mawkishly sentimental plot, features a mouth-watering line-up of cameo performances from Bruno Walter, Lily Pons, Gregor Piatigorsky, Risë Stevens, Artur Rodzinski, Jan Peerce, Ezio Pinza, Jascha Heifetz, Fritz Reiner, Leopold Stokowski – and Arthur Rubinstein. Rubinstein, playing Chopin’s A-flat polonaise and De Falla’s Ritual Fire Dance, makes one of the strongest cinematic and musical impressions. Ramrod-backed, poker-faced and gazing from time to time into some ethereal middle distance, he is the very embodiment of the pianist as aristocratic artist. That image – carefully cultivated by his management and reaching its eventual apotheosis in a prestigious 94-CD Arthur Rubinstein Collection (“106 hours covering his entire recording career, fully remastered and packaged together in a unique, specially designed box”) – is one of two that remain in the public consciousness today. The other is, of course, that of the bon vivant and inveterate womaniser who, at the age of 83, began an affair with a young woman 60 years his junior. But focusing exclusively on Rubinstein as a Grand Old Man of the piano is to overlook an earlier phase of his career when, if not exactly an enfant terrible, he frequently demonstrated a greater degree of flexibility, spontaneity and sheer joie de vivre than was sometimes later the case. The two concertos presented here are cases in point. The Brahms, Rubinstein’s first recording of any concerto, emerges, in particular, with a distinctive celerity and lightness of touch. The speeds in three of the four movements are notably faster than those of his immediate contemporaries – let alone those of most performers today. Thus, the first movement clocks in at 14:35, compared to 15:53 (Schnabel, 1935), 16:04 (Backhaus, 1939) and 16:15 (Horowitz, 1940) and the same picture emerges from both the Andante and the concluding Allegretto grazioso. Only in the second movement Allegro appassionato does Rubinstein adopt a tempo comparable to that of his contemporaries (though not to that of post war soloists who have frequently tended to adopt a broader - if not, indeed, a more ponderous - style). This whole approach is, to modern ears, a novel and striking one that successfully offers an alternative viewpoint on a very familiar work. It is sad, therefore, that the original recording was not one of the best: Rubinstein later recalled how he was positioned way off at the back of the stage and the frequently acclaimed acoustics of Kingsway Hall seem, on this occasion at least and in spite of all Mark Obert-Thorn’s heroic efforts at restoration, to have been ineffectively reproduced on disc. The opening of the state-of-the-art Abbey Road studios in 1931 meant, however, that Rubinstein’s June 1932 recording of Tchaikovsky’s first concerto could be recorded in far superior and more immediate sound. Again, its abiding characteristic is innate elegance and sensitivity, coupled with a marked fleetness of foot. Rubinstein’s opening movement, for instance, clocks in at 17:52 – nearly two minutes less than Solomon’s acclaimed (and similarly un-barnstorming) 1929 recording with Hamilton Harty and the Hallé Orchestra – and, although the differentials in the other two movements are not as marked, the overall timings for the complete concerto come in at 31:05 for the Pole and 33:17 for the Briton. 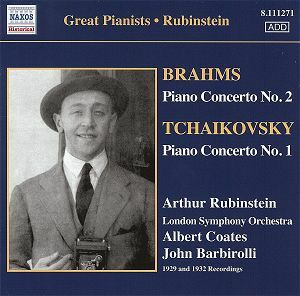 Of course, the improved Abbey Road sound also allows us to hear the orchestra more clearly and my initial impression was that Barbirolli’s accompaniment is a little anonymous and bland: why, for goodness sake, was Albert Coates, still highly regarded even today for his fiery interpretations of Russian music, not employed as he had been for the Brahms? But, on repeated listening, it becomes clear that Barbirolli’s approach is far more of a piece with Rubinstein’s overall conception of the work and that he was, indeed, the correct choice. This is certainly an important and worthwhile addition to Naxos Historical’s “Great Pianists” CDs. All the other performers and their recordings mentioned above are to be found among earlier releases in the series and it is now a particular pleasure to see Arthur Rubinstein joining them as a worthy member of this particular pianistic pantheon.